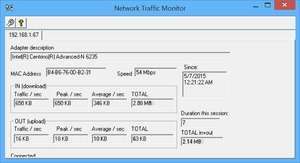 Network Traffic Monitor is software that can be used to monitor the Internet traffic on a PC. The application shows how many bytes were uploaded or downloaded and it maybe useful for people with Internet service which is capped by volume. Version 1.0.5.3 is a freeware program which does not have restrictions and it's free so it doesn't cost anything.